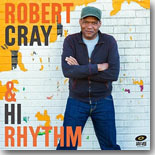 Robert Cray gets more soulful on his latest album, heading to Memphis and collaborating with the Hi Rhythm section for a fantastic new album, an easy choice for this month's Pick Hit. The Cashbox Kings are back with a new CD, Royal Mint, and as one of the cuts says, it's a real "House Party!" It's our Surprise CD of the month. Our Flashback album of the month features a 1973 live recording by legendary guitarist Otis Rush. Our What's New section features new CDs from Andy T Band, Billy Flynn, Mr. Sipp, Hurricane Ruth, Chris Antonik, Delta Moon, Lauren Mitchell, Sean Chambers, Josh Hyde, Steve Krase, and more.